Nestled into its charming Midtown Village locale, Olivier Desaintmartin’s second Philadelphia feat, Zinc, is the essence of class meets comfort. In a city filled with attempts at the French bistro, Desaintmartin sets this 11th street gem above the rest by offering unfussy bistro classics and an exclusively French wine selection. Zinc offers diners the rare chance to feel right at home with a dining room décor that features exposed brick, dark polished wood, bistro chalkboards and authentic Parisian paintings. Complete with a knowledgeable and friendly staff, Zinc’s quaint, romantic appeal is reminiscent of a true bistro a vins one might find during a spontaneous stroll through Ol’ Paris. Le Marais, the oldest part of Paris, is known for its “off the beaten path” appeal with streets marked with quaint bistros and brasseries, often frequented by locals and artsy types. Without booking an expensive vacation, Philadelphia foodies are able to get a feel for what brunch or dinner in one of these Le Marais charms is like through, ZINC, a little bistro a vins situated on South 11th Street. ZINC, located in the city’s vastly popular Midtown Village, is a friendly neighborhood bistro that offers Philly its own little slice of Paris with comfortable French bistro food and a warm, intimate atmosphere and authentic touches reminiscent of a bistro you might actually find on a stroll in Paris’s historic district. With its cozy coffee shops, dainty boutiques and sharply dressed populace, Midtown Village lays an appropriate backdrop for the second of head chef and owner Olivier Desaintmartin’s Philadelphia restaurants. His first, Caribou Café, sits just a few blocks away. When Zinc opened in 2007, Desaintmartin envisioned a comfortable ambiance that was both friendly and professional. His initial objective for the restaurant didn’t focus so much on food as it did on a friendly bar atmosphere that offered small plates. From there Desaintmartin’s vision for the restaurant evolved its current focus on “Cuisine bourgeoise” – introducing Philadelphians to dishes similar to those found in the neighborhood bistros and home-cooked meals of Le Marais. 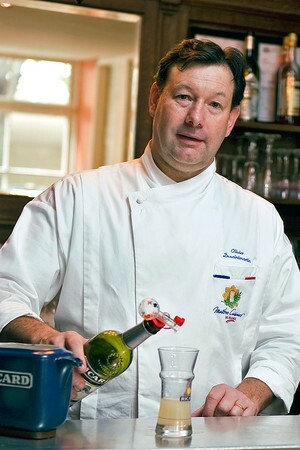 Desaintmartin, whose mastery of the culinary arts is exemplified through his award of the 2009 Maître Cuisinier de France, delivers his vision with impeccable accuracy in Zinc – offering traditional French dishes alongside a superior selection of French wines by the glass in an ultra cozy setting. 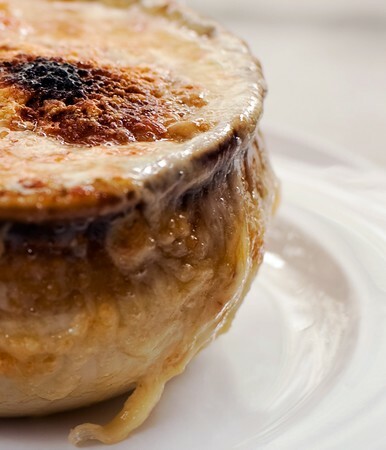 Ingredients such as skate, escargot or calf’s liver might seem a bit exotic to the American palate, but Desaintmartin makes them less intimidating with tasteful presentation and home-cooked flavors. Mixing in tasty sauces, a variety of herbs and traditional sides and accompaniments, Desaintmartin makes his dishes so hard to pass up, that diners may find themselves trying new things. 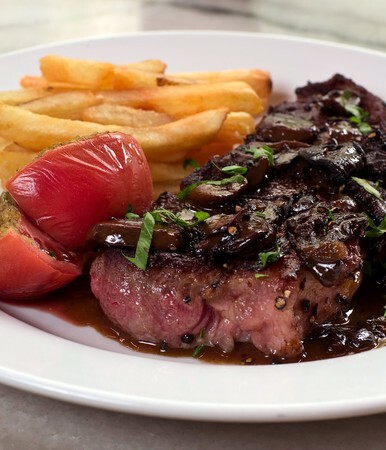 Classic staples like steak frites and scallops grace the menu and can be purchased in either large or small portions, which changes seasonally but stays the same for the restaurant’s designated brunch and dinner hours. Approaching Zinc in the summer dusk, a warm feeling seems to radiate from its charming locale. Endearing touches, such as tiny string lights dance like little stars around the perimeter, draw the eye toward the navy blue awning that spells out ZINC in light lettering. Underneath, tall wooden stools with flat-topped barrels pose as tables for outside dining that’s different from the typical al fresco feel. Phrases such as “Apertifs” and “Charcuterie” are sprawled across the restaurant’s front window and inviting bouquets of fresh flowers sit in the windowsill alongside little knickknacks, adding to the overall feeling of authenticity. Diners that are drawn inside of Zinc are instantly warmed by the small, intimate dining room. Soft jazz music and quiet conversation fill the air and mingle with the home cooked scents that creep from the kitchen and tantalize the palate. The dining room, which seats up to 40 people, is filled with rows of two-top tables covered with white table linens. Exposed brick walls, dark polished wood, chalkboards displaying daily specials, dark framed mirrors, and prints with French phrases enhance Zinc’s bistro ambiance. Toward the back of the restaurant lies what Desaintmartin describes as his “little jewel” – a bar made of zinc that was constructed in 1919 and originally sat in a Parisian bar. Desaintmartin purchased the rare find from Paris, shipped it to the U.S., refinished it and placed it in the rear of the restaurant. The namesake piece looks as though its been taken out of a classic French movie, but aside from being beautiful and interesting to look at, Zinc’s bar offers an abundant selection of aperitifs, wines from all parts of France, bottled beers from all over the world and a list of traditional and creative cocktails. In light of Desaintmartin’s most recent award, diners recently have the privilege of being able to select a sparkling spirit called Master Chef of France “brut”. The specially made blend of Chardonnay and champagne is dry and wonderfully fizzy. Perhaps the best part of this one of a kind spirit is that it can be bought for less than $30 a bottle. Served slightly chilled in a classic champagne flute, it’s a lovely drink to sip slowly as you prepare for your leisurely meal. My meal begins with a plate of baby octopus, Scupions Provencale, as it is called on the menu. The delicate piece of seafood arrives dressed with tiny flecks of green, aromatic herbs amidst a light sauce of white wine and tomatoes. 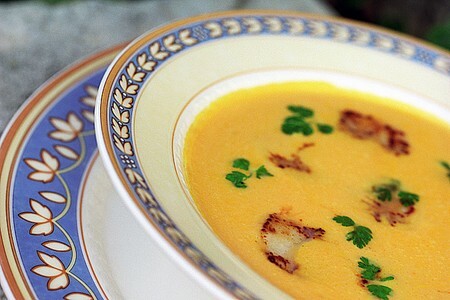 The herbs are earthy, not too spicy, and the sauce has a faint hint of honey, both complement the tender meat very well. The second course that comes to the table is Feuillete d’Escargots – Escargots, mushrooms and almonds served in a puff pastry amid a white wine sauce. Inside the delectable little pastry, the meaty bits of escargot brought to life by hints of fresh parsley. The tastes of the tender meat, sauce and earthy mushrooms all running together with the flaky pastry are robust and savory. The almonds that intermingle throughout the dish offer a nice crunchy, almost oak-like flavor. With all of the textures and flavors that mix together in this dish, it is by far one of Desaintmartin’s most interesting. Next comes the Crevettes au Poivre – Jumbo shrimp served au poivre style over a serving of chilled, ratatouille that is alive with beautiful earth-toned red colors. The ratatouille brings this dish alive through a delicious medley of hearty vegetables and spices enhanced by a chilled, not too cold, temperature. This dish, which my server tells me comes from the South of France, is thick with tomatoes and zesty herbs, almost like a very thick vegetable soup. The sautéed hunk of meaty shrimp in the center is accented by a strong flavor of roasted peppercorn. Paired with a small helping of horseradish, the dish is hearty and deeply savory. After that comes the Raie Charcutiere --pan seared skate with herbs vegetables, white wine sauce and a touch of butter. The sauce is light in texture and flavor and doesn’t overwhelm the tenderness of the fish. The skate meat is delicate in flavor and texture, and melts wonderfully on the palate. In fact you don’t even need a knife to cut into it. When Darina, our waitress, brings out my final entrée, the Foi de Veau – she tells me she likes it better than steak. The dish consists of calf’s liver, served over a potato leek cake and bathed in a vinegar sauce. The tender meat is similar to a steak, except much more light in flavor and absent of the chewy consistency that tends to characterize the traditional dish. It tastes slightly sweet and is nicely browned on the outside and slightly pink on the inside. A slight contrast found through the smooth leek cake and the earthy herbs of the sauce enhances the delicate tastes and textures of the meat. With the calf’s liver I’m served a light bodied glass of red wine that Darina tells me is called Fitou and comes from Southern France. 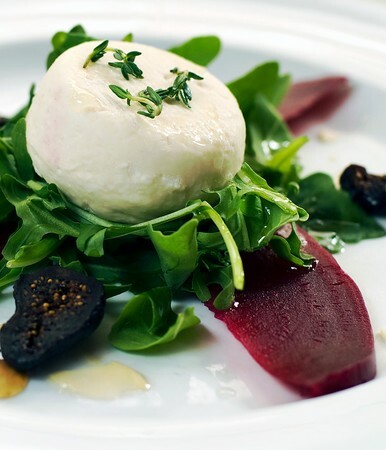 What stands out about the dish is the texture, and with the wine it tastes even smoother against the palate. The sweetness of the dish pairs well with the spicy, earthy hints of fruit in the wine. For dessert, the Chocolate Pot de Crème is presented in a quaint white pot that almost resembles an espresso cup. This traditional French custard dessert is almost the same consistency as crème brulée, only a bit denser and jam-packed with an insatiable, savory cocoa flavor. The deep, roasted chocolate flavor and rich custard texture contrasts well against a light, single dollop of fresh whipped cream. The dish is topped off with a fine dusting of cocoa powder, which brings it all together nicely. Paired with a standard cup of coffee that won’t overwhelm the roasted characteristics of the chocolate flavor– you’ll want to make this little pot of heaven last forever. Insider Tip: The dining room is fairly small as far as restaurants in general are concerned, but don't let that discourage you from choosing ZINC for your next large party. All it takes is a little bit of advanced notice for the staff to accommodate parties up to thirty or more, with the option for a full buy-out available as well. Is the entire restaurant available to rent out for large parties? Yes, Zinc can be entirely rented out, with advanced notice of at least one month. The restaurant can also accommodate events for parties of 30+ any day for lunch. Why is the restaurant called ZINC? It is named for the nearly hundred year old zinc bar that was bought in Paris, shipped to America, and now serves as the restaurant's bar. Are there any theatres in walking distance of the restaurant? There are a few theatres that are located 2-3 blocks from the restaurant. They are the Walnut Theatre, Forrest Theatre and the theatres on Broad Street's Avenue of the Arts. Where should I park when I am coming to the restaurant? Parking is available at the Dorance Hamilton Building on 11th Street between Locust and Walnut Streets. Are reservations required to dine at the restaurant? No, however reservations are highly recommended due to the small size of the dining room. Option A: $38 per person, Option B: $45 per person. Prices do not include taxes and gratuities (20%). For all private events, we offer Cash, Limited or Open Bar. Quiet enough to carry on conversation, casual enough to wear jeans, four star quality food. Doesn't get any better. Oh, yeah, and you can BYOB. You won't be disappointed. Everyone at our table agreed that the Pork Sweet Cheeks were the favorite. We had a great time. Good food and service. Loved it! I felt like I was in France. The music and waitress was amazing. Food was also very good. I definitely want to go back. They had a good variety of dishes, and all of them were absolutely wonderful! The waitstaff was very helpful and cheerful despite the full restaurant. Loved the atmosphere, great food, and friendly caring staff. If you are looking for an excellent meal with good atmosphere to eat before a theatre show, Zinc is it. It has a cozy atomsphere, a good selection of wine and the food is fantastic. Make sure to ask for the window seats, so that you can see the people on the street. You will not be disappointed! This restaurant was absolutely incredible. While the food was some of the best French cuisine I've had, the atmosphere was not stuffy like most other French restaurants. The smaller size of the restaurant made it cozy rather than uncomfortable, and the servers were all very attentive. I was with a large group and therefore tried almost everything on the menu, and each bite was absolutely perfect. I would highly reccommend ZINC. A real French type bistro. The pressed Duck is outrageous. 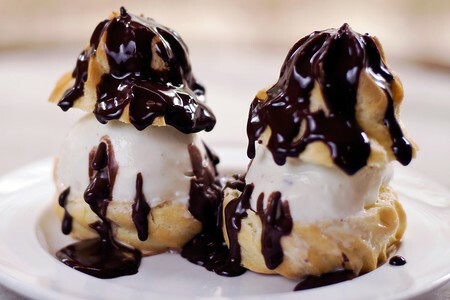 French food at its finest! Enjoyed the quaintness and coziness of the restaurant. The waitress was very helpful and knowledgeable. Would come back again and again. Loved it!!! I live in San Francisco, and was home in Philly to celebrate my 40th birthday with friends from days gone by. I was looking for something quaint and cozy with delicious food and wine at a decent price. Zinc more than met my expectations, and was a wonderful place to make more memories. The atmosphere was really great as it was a nice night. My wife and I had drinks outside and then came in for dinner. The waiter could not have been better--great attitude good food suggestions and very attentive and we were able to have him inside and outside. The place was a bit pricier than advertised as if you really want to get what they have which is great, the price fixe will not work. I will go back here whenever in Philly. great food. great atmosphere. loved the experience. The food at Zinc's was phenomenal! My wife and I had the table by the window and thoroughly enjoyed our evening. Great food, great drinks and really great service. What more could you ask for? We're going again! We went with my parents on my mom's birthday. It was small and quiet and very personal service. The food was outstanding and the prices were very reasonable. My family had a great experience at Zinc. The menu was terrific, and our food was delicious. Great time! I brought my girlfriend of 5 years to this restaurant for our anniversary and it was terrific. Before we even got there the staff was extremely helpful with setting up the reservation (I did it online but called to verify). When we arrived we were seated immediately. Our waitress was pleasant and very helpful. The food...fantastic, especially the lobster risotto. I'm not very knowledgeable on wine but our waitress was again helpful and the one we chose was perfect. Couldn't have been happier with the entire experience. My only word of caution is that this is a TIGHT SPACE. Anyone not comfortable with eating in the immediate vicinity of other should beware. To all others: If you're looking for great cuisine outside the "run of the mill" ZINC is perfect. There were six of us dining and each person ordered something different. Everyone loved their meals. This never happens with this bunch! I was very impressed with the food choices and quality. See: "I loved about the restaurant." Zinc - Serious Dining Experience. I give this restaurant five stars because of its combination of atmosphere, relaxed dining experience, excellent staff and very well prepared meals. I was happy to find an excellent bottle of my favorite wine that I had discovered while vacationng in southern France. Classic bistro fare with a twist. Charming ambience and delicious fare. Must try the apple bread pudding. I brought 3 customers from China to Zinc while attending the Light Fair. Everybody loved the food and the relaxed ambient of Zinc. The waitress was most courteous and helpful. That night I left my iPad behind and the GM of the restaurant was so great in helping me to get it back despite the odd schedule we had. Great dinning experience for us! We happened to be visiting Philadelphia during restaurant week, and were lucky enough to get a reservation in this lovely little place. It's quite small and intimate but cheerful and lively, very much like a cafe you might stumble on after getting lost in the back streets of Paris. I ordered the chef's menu, which consisted of an amuse bouche of crab soup (a hint of celeriac there), an heirloom tomato salad, beouf bourguignon with braised Brussels sprouts over mashed potatoes and for dessert, a slice of bread pudding with some sort of lovely sauce over it. All of this for the very reasonable Prix fixe of $35. I have not the words to describe how incredible this meal was--every bite of it--except to say, I now know what my last meal would be. This, exactly. You simply must try this place. Small but special. Food was inventive and wonderful. Wait staff was knowledgeable ond helpful with food choices and wines. Had a wonderful time. My husband and I visited Philadelphia for the Flower Show. We chose Zinc restaurant because we enjoy French restaurants having been to France twice before. Our experience at Zinc was outstanding. The food, ambiance and service were all excellent. There was a great variety of appetizers and entrees on the menu, and it was hard to choose because they all sounded wonderful. We were not disappointed in our choices. Price wise, it was very comparable to a fine dining experience. Wine prices were very fair. We look forward to visiting Zinc next year when we return to Philadelphia. The menu was excellent, really French Bistro food and otherwise French foods and preparation. The kitchen , also excellent. The choices were imaginative, food very tasty. Did not feel the portions overwhelming, therefore one was able to try apps, and salads, etc. Dessert could be shared and excellent coffee also. What a find - a delightful experience. The food was great, especially liked the signature salad with the beets and wonderful dressing. I had the lobster ravioli appetizer as my meal and it was fantastic. Why go to Paris, France or Montreal when you have ZINC right in Center City Philadelphia, PA. The service was attentive and friendly. I was there during a convention and wanted a place for a quiet dinner with a friend. Not an easy request, but we found it. A wonderfully warm and welcoming restaurant with excellent but non-intrusive service, a menu reflecting the chef's regional preferences, and a well-thought out reasonably priced wine list. Cheese course was FABULOUS. We are in the catering business and we found this restaurant to meet all of our expectations - great food and wonderful service - we will be back. Good value. Food was good bistro fare. Waitress very helpful, made several excellent suggestions and was very attentive without being intrusive. I like this place. Meal was awsome. Service was nice too. But the place was a little small specificly for 2/14 when everybody is there. It was too meny people for romance in one place. Overage experince is good because of the food quality and service received there. The food was of a quality and presentation that you would expect of a much fancier and fussier restaurant. It was a lovely smart casual dinner. My husband and I really needed a date night away from the kids of good food, drink and nice place for us to catch up with each other. This place really fit the bill. Nice small French bistro in Midtown Village. The charcuterie platter is great, they have excellent wines and beers as well. Food is very good. Good french sauces. However, portions on some dishes are rather small. 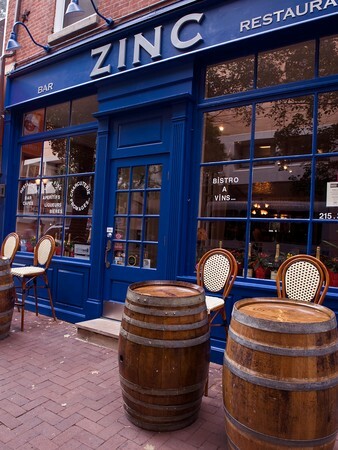 If you are looking for some fantastic french food that doesn't cost an arm and a leg then go to Zinc. Great food, great wine, and staff that goes out of their way to please. Only drawback is that it is small so probably not a good venue for a large party. A lovely, very clean restaurant in Philadelphia that has a true French Bistro feel. Nice selection of entrees with the option for a large or smaller portion set at different prices. Nice for those who wish to dine without feeling overly full. A perfect place to meet friends or for a romantic or casual date. Very authentic French bistro. Great good and atmosphere, friendly and knowledgeable service. Highly recommended. The rustic appeal inside Zinc are mainly due to the classic Parisian posters and tasteful, understated chic decorations. The seating was comfortable despite the closeness of everything, but instead of this being a negative it truly allows you to enjoy an intimate yet lively meal. About the meal: The food is delicious, all of it! The scallops are delectable and the lamb dish heartily delicious and very filling. Food: excellent. Veal sausage was excellent, excellent. Wine: Great French Bordeaux. Servers: Great. Service: Very good, not great. Ambiance: Good; expected more. We got stuffed in a small alcove near the front window basically in another couple's lap, so we were certainly removed from the ambiance. If you go early, don't let them stuff you in the corner like they did to us! Overall, we would recommend it and will go back someday. A really good place! I took my wife here for her birthday and we had a lovely time. The food and service were excellent! This is a VERY small store converted into a restaurant with a curtain barrier to reduce strong winter winds through the front door. Their rush to add one more table results in heavy overcrowding that is either claustrophobic or friendly depending on the folks at the tables next to you. The menu was limited but star studded from appetizers through dessert. We had an excessive wait while theater goers were served, even for a second basket of bread and no butter. The appetizer mussels almost made me change to the dinner option, but the skate was up to the best we had in France. We loved the bread pudding but sugar junkies would be disappointed. If the service were to the same standard as the food then the high price would be worth it. The food was decent but the space is a very tight. Easy to make reservations, Polite & Efficient Waiters,Good Variety of Food Choices. Pleasent surroundings. We had a wonderful dinner at Zinc. The food and service were excellent. This was our first time eating at Zinc. Everything that we ordered was excellent (cheese & charcuterie, escargot, tartare, mussels and scallops). Portions were great. I like that you have the option of a large or small entree. Service was attentive but not overly so. Our main waitress (don't recall her giving us her name) was wonderful - so non-obtrusive, which is rare). It was really a rather flawless experience for us. We had an 8:30 reservation and were seated immediately upon arrival. In my online reservation I requested a window seat, and we got one. The only thing I wasn't thrilled with, but I'm not complaining, is that the bottle of $69 wine was good but not great. I would definitely recommend Zinc. I will definitely go back. Great parisian experience.. great service and excellant food. A bit pricey though. The food and service was great, the only knock I have is that the restaurant is very small, but it wasn't crowded when I was there. Zinc is a pleasant taste of France in Philadelphia. Food,atmosphere and ambiance are true to the Parisien Zinc bar experience. Tables are close together allowing Cotes du Rhone enhanced conversations among guests. Dishes were rich and satifying and executed with attention to technique. Portions are small or large anought to finish desert and not feel guily about it. First course was served in a shot glass, this one was humiliating small. The rest was very nice. My wife and I enjoyed an excellent meal at Zinc. At reasonable prices all of the dishes we ordered were delicious. I particularly enjoyed the lobster over pasta in a champagne sauce that was the chef's special that evening. My only complaints were that our waitress was aloof and inattentive and the tables in the restaurant are very close together. I was elbow to elbow with the two strangers next to me and found it difficult to enjoy a private conversation with my wife. I would recommend diners requesting a table by the window when placing reservations, as those tables seemed to offer more privacy than the rest. Quiet evening in Center City - Great experience. Intimate setting, with exposed brick walls. Food, drinks and service were terrific. Best of all, noise level permitted conversation among our party without any strain. I'll be back. Had a very enjoyable dinner. My first time at ZINC, but my wife had been while visiting Philadelphia a couple of years ago and remembered it fondly and wanted to dine there again. Waitress was helpful with the right about of attention given, and the food was delicious. Wonderful little place with the fresh authentic flavors of France. Found ZINC on the internet and was happy with the service and food. Quaint, non touristy and didn't feel rushed. Great atmosphere. The staff were very nice and accommodating of my 2 year old son, the wine was excellent but what really blew me away was the totally amazing food. Some of the best French cuisine I've had. And the traditional bistro setting tops it off. All in all, a great night out. We went to ZINC before attending a show at the Walnut Street Theater - the food was excellent, the portions were satisfying, each element of the meal was flavorful. The service was friendly and helpful. The atmosphere was comfortable. I would recommend this restaurant to a friend. 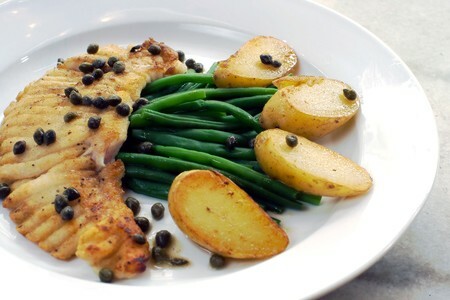 Try ZINC for the Parisienne flavor! Great location for walking from downtown hotels. Very friendly service and delicious food. Ask for a table in the window. I was impressed when I walked in to the small seemingly cozy restaurant. That was about were the impression was left. The waiter was very nice and very aware of our needs, but he looked as if he slept in his shirt and was covered in food from head to toe. The food looked great, really looked like a piece of art. The taste was awful all around we had to send both plates back to the kitchen to be cooked the rest of the way through. Chicken was still pink and the fish was served cold. This was not just are table it seem all of the plates were going back and forth from kitchen to tables. I know I will never be returning. My stalwart favorite for a nice evening has gotten too loud. 72 decibels by my meter on an early Saturday evening - and getting louder as we left. Disappointing steak frites and $90 total for two made the evening not so fun. Take some tables out and put some acoustic ceilings in - and Zinc will again be the comfortable bistro it should be. ambience good. Food just ok. Wait service was barely acceptable. Because we were a party of 8 and a 20% gratuity would automatically be added onto our bill the waitress was minimally engaged with our party and rather curt and abrupt... and even conveyed a degree of annoyance when asked for her suggestions on some of the menu offerings. Probably would pass on going to Zinc again only because of the service. nice ambience, but off the beaten track. Specials were only so-so. Felt that we were being rushed. Don't sit anywhere near the door on a cold night or you'll freeze! Nice place, frendly service, horrible food. Seemed quality of food was high, just the way it was prepared was awful. Go for a drink, have some bread, then run. They closed the restaurant, never informing us of their being closed that day.....Would not recommend this place to anyone! Beware the automatic 20% tip! Zinc is a cute little French bistro. They have a horrible policy of charging 20% automatic gratuity for parties of 5 or more. If you have 5 or more people expect to completely ignored! I booked well in advance for a special occasion. Our table was gone when We arrived five minutes early and we were greeted as if it was insulting that we showed up. We were told to stand in the doorway to wait. My 85-year-old mother was not offered a chair. Twenty minutes after the time of our reservation, I asked when we might be seated. The waiter acted as if I had insulted him, and he did not answer the question. We were never offered a chance to buy a drink, nor offered menus. We left after a couple that entered after us were seated within minutes. I cannot comment on the food or wine, but the staff did their very best to make us feel unwelcome. The place felt 'off' from the moment we entered, and the arctic winds rushing in from outside each time the door opened only added a little to the general chilliness. If you want good food, good service, and a pleasant atmosphere, go somewhere else.